There are 55 Honey Locust trees growing in New York City’s Zuccotti Park, the central locale of the 2011 Occupy Walls Street protests. 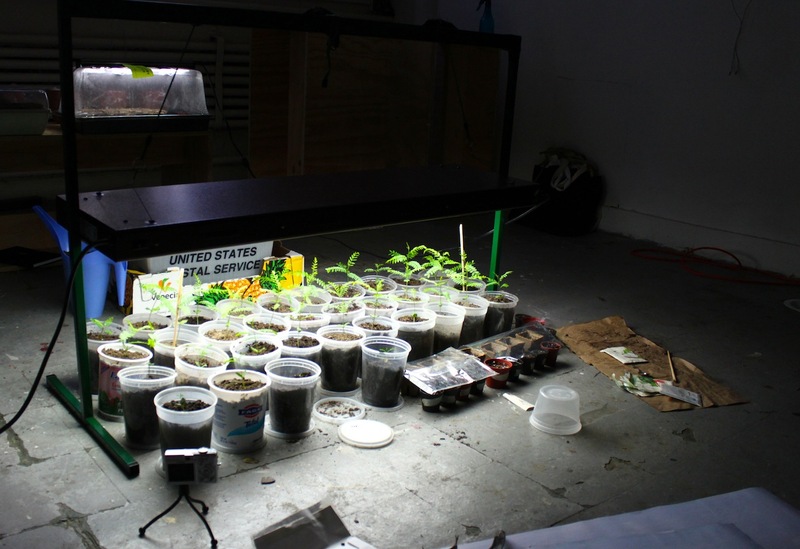 Artist David Horvitz collected the seeds from those trees in 2012 and is now germinating them during his artist residency at New York’s Clocktower Gallery. On Saturday, May 4, the artist and a group of volunteers will carry the little trees, one per person, to Stamford. The plants will continue to grow there through June 16, adding to Franklin Street Works’ exploration of sustainability, art, and activism in the current exhibition Strange Invitation. Franklin Street Works hopes that you can join them in taking part in this collaborative performance and to bear witness to the relocation of these Honey Locust trees. NYC participants will meet up at 12:30 pm at the Clocktower Gallery. Connecticut participants will meet up at Franklin Street Works at 10:30 am or join us at the Stamford Train Station for the 11:03 train, on the third car from the end. To sign up and be a part of the performance please email your RSVP to sandrine@franklinstreetworks.org. David Horvitz is an artist from California who is currently based in Brooklyn. He works in a variety of media, including photography, video, web-based work, publications, and watercolor. He writes about his project at the Clocktower: "There are a group of Chinese Elms in eastern Colorado that I think frequently of. They grow at the former site of the Amache Internment Camp. My grandmother told me that when they arrived at Amache, the land was barren and empty, and that those interned in the camp had planted the trees that now stood. Knowing this, when you look at the trees you see the history of the place and the people who were once there. But the trees have no plaques. And if you don't know this, they are just trees in a landscape. The day after Sandy hit New York City I rode my bike with some friends through downtown Manhattan to look at the aftermath of the storm. After biking over the Brooklyn Bridge we made a brief stop at Zuccotti Park. During the previous months I had been collecting the fallen seed pods from the fifty-five Honey Locust Trees that decorate the park. The storm had brought down most of the pods that were still hanging on the trees.